DALE EARNHARDT JR 2014 DAYTONA 500 WIN RACED VERSION DIECAST 1/24 ACTION. DALE EARNHARDT JR 2014 DAYTONA 500 WIN RACED VERSION DIECAST CAR - 1/24 SCALE by ACTION. Comes with authentic winner sticker, bag of confetti from victory lane, and special laminated winner insert! On February 23, 2014, Dale Earnhardt Jr won his second Daytona 500 - ten years after his first win. He did it driving his newly redesigned National Guard Chevy SS. This raced version diecast will be replicated to look exactly as Dale Earnhardt Jr's did in victory lane, complete with all the scuff marks and dirt his car picked up along the way. Limited edition of 15,888 made. 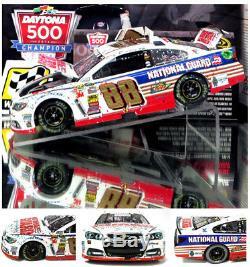 This is an Action Performance Platinum Series collectible, the #1 name in NASCAR diecast collectible cars. To shop the rest of our Dale Earnhardt Jr 2014 Daytona 500 win merchandise. We have been serving thousands of NASCAR fans online since 1999. We also operate a full-fledged walk-in store located in Gainesville, GA. We take collecting diecast seriously. The cars we send are mint, unless specifically stated. Your item is brand new. No smoke , no pets, Brand new out of a new case.. The item "DALE EARNHARDT JR 2014 DAYTONA 500 WIN RACED VERSION DIECAST 1/24 ACTION DIECAST" is in sale since Monday, December 10, 2018. This item is in the category "Toys & Hobbies\Diecast & Toy Vehicles\Cars\ Racing, NASCAR\Other Diecast Racing Cars". The seller is "diecast_dealer" and is located in Gainesville, Georgia. This item can be shipped to United States.